Giving employers a significant win, a sharply divided Supreme Court upheld the right of employers to include arbitration clauses in their employment agreements that seriously curtail employees’ ability to file class actions and pursue court claims for wage and hour violations. The case was closely watched by advocates on both sides of the issue as a decision in the case would present a large shift of power to one side or the other in labor disputes. The issue was this: The Federal Arbitration Act signals a strong intent on Congress’ part to allow and promote arbitration in all disputes. But the National Labor Relations Act gives employees a strong right to organize and act collectively. So which Federal statute prevails? Does one override the other? The Obama Administration’s appointees to the National Labor Relations Board starting in 2012, began interpreting the NLRA as overriding the Arbitration Act. It is this Court’s duty to interpret Congress’s statutes as a harmonious whole rather than at war with one another. And abiding that duty here leads to an unmistakable conclusion. The NLRA secures to employees rights to organize unions and bargain collectively,but it says nothing about how judges and arbitrators must try legal disputes that leave the workplace and enter the courtroom or arbitral forum. This Court has never read a right to class actions into the NLRA — and for three quarters of a century neither did the National Labor Relations Board. Far from conflicting, the Arbitration Act and the NLRA have long enjoyed separate spheres of influence and neither permits this Court to declare the parties’ agreements unlawful. 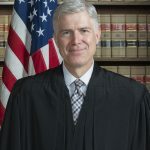 Associate Justice Neil M. Gorsuch; photograph by Franz Jantzen, 2017. Section 7 [of the NLRA] focuses on the right to organize unions and bargain collectively. It may permit unions to bargain to prohibit arbitration. But it does not express approval or disapproval of arbitration. It does not mention class or collective action procedures. It does not even hint at a wish to displace the Arbitration Act—let alone accomplish that much clearly and manifestly, as our precedents demand. The inevitable result of today’s decision will be the underenforcement of federal and state statutes designed to advance the well-being of vulnerable workers.The probable impact on wage and hours claims of the kind asserted in the cases now before the Court is all too evident. Violations of minimum-wage and overtime laws are widespread. One study estimated that in Chicago, Los Angeles, and New York City alone, low-wage workers lose nearly $3 billion in legally owed wages each year. The policy may be debatable but the law is clear: Congress has instructed that arbitration agreements like those before us must be enforced as written. While Congress is of course always free to amend this judgment, we see nothing suggesting it did so in the NLRA—much less that it manifested a clear intention to displace the Arbitration Act. Because we can easily read Congress’s statutes to work in harmony, that is where our duty lies. Under statutory analysis, I think Gorsuch got it right. It does not make sense that the NLRA’s language was meant to override the FAA. The NLRA was meant to preserve the rights of workers to organize and bargain collectively, it dd not concern itself with the collective rights under the FLSA. And it is not for the Court’s to enact policy over the clear language of a statute. Make no mistake – this is big news for employers and very bad news for low wage workers and the lawyers who bring FLSA claims. Wage and hour claims per employee are generally not that large. It would be difficult to find lawyers willing to take on large companies over petty claims if they can’t tie in all other similarly situated workers. And knowing this, supervisors and managers in large companies are more likely to take the risk and push the envelope in how much they can save off wages by bending the rules slightly. Since Congress is unlikely to act to address the issue, State legislatures that want to preserve collective wage and hour claims would be wise to enact legislation prohibiting these agreements in these types of cases. For employers – of all sizes frankly but especially large and mid-sized ones – the message is also clear, send out an arbitration agreement via email to all your employees that will protect your company from class/collective wage and hour claims. Fake Merrick Garland was put on the court specifically because he will screw workers. So no surprise.